Landmine kills over a thousand people yearly, and governments are having a hard time sweeping the areas using traditional methods which cause random trips which make it even dangerous even for the demolition team. Massoud Hassani escaped the Taliban last 1998 in Afghanistan which was later followed by Mahmud, his brother, two years later. Now, the two brothers are living peacefully and are already Dutch citizens over at Eindhoven. However, the experiences both brothers have seen- mass murder, terrorism and friends killed by landmines still haunt the brothers. Also, aside from the reported 18 million unexploded bombs that have been retrieved at Afghanistan last 1989, the area itself and as well as other countries are still covered with these dangerous devices that can kill a random passerby in an instance. The brothers did not move on from that experience and was dedicated to accomplishing the impossible. Massoud graduated from the Design Academy Eindhoven, and his final project was the mine kafon. The name came from the Dari word “kafondan” which means something that explodes. The first version of the device resembled a giant dandelion which has puff balls as cover. This art project evolved with the help of Massoud’s brother. The device is now a rolling, mine-clearing device and is powered by the wind which can randomly trigger landmines with the plastic stalks. 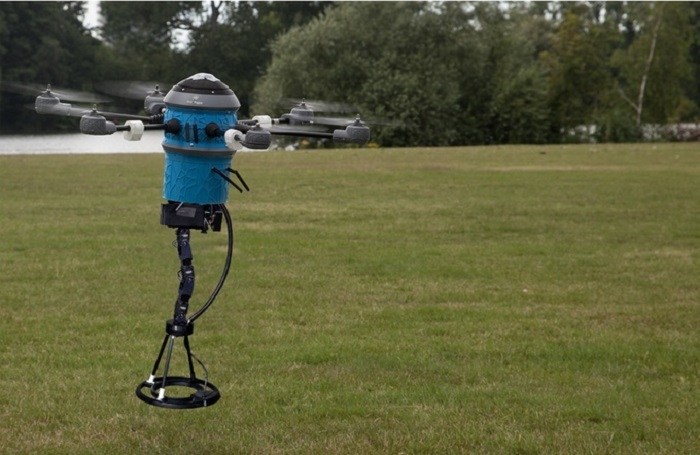 The first version of the device won several approvals from different anti-landmine agencies, and now, the team is now supported by the Dutch Ministry of Defence. 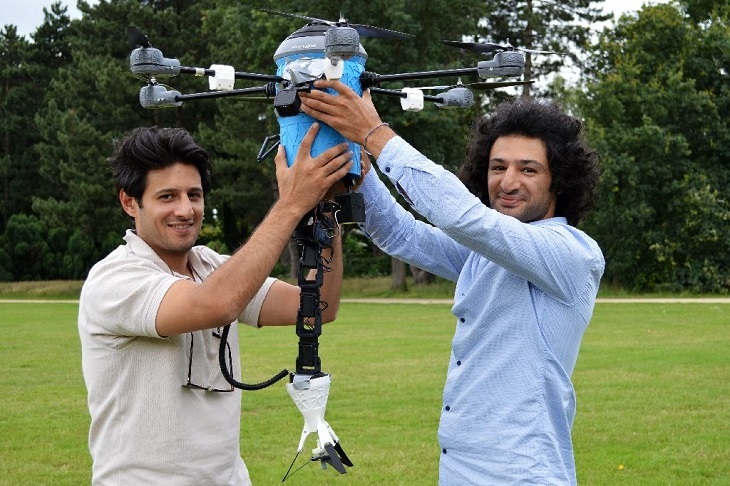 The brothers were able to improve the prototype and later on created the Hassani Design BV last 2013. The Mine Kafon Drone weighs 10 pounds which are 3D printed and can clear up active landmines 20 times faster than the traditional technology. 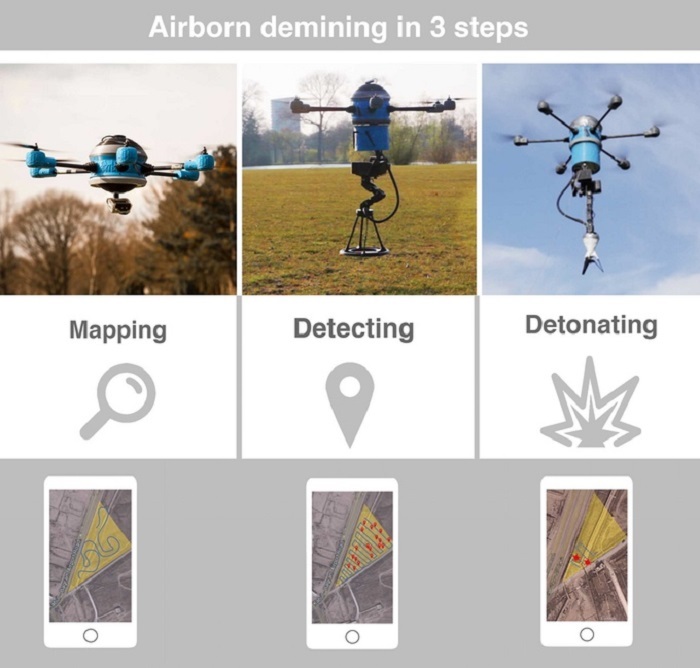 The drone has a 3-step process when clearing an area. The first phase is to survey the area with its scanners and it can automatically 3D map the area and pinpoints dangerous spots with is GPS. Second, the drone will hover around marked spots but this time, with its robotic metal detector arm. This sensor arm can geotag the areas and creates a precise map of the landmine’s location. Lastly, the robotic arm is also equipped with a carrier that can hold small detonating devices. These detonating device can be detonated from a distance by a timer which is very safe for the handlers. The project is set to have a Kickstarter campaign to raise $77,464 up to August 31. As of now, the campaign has already managed to raise $20, 000. The next step for the team is to have a field test demonstration in front of individual organisations which showcases the sturdiness of the material against different climates and environment. The campaign involves pledge rewards from a bracelet that has the Mine Kafon logo which costs $13 to a three-day drone seminar and workshop that can cost up to $7, 746. The rewards for the contributors can be any of the following: 3D printed Mine Kafon Miniature, a lamp designed by the Hassani brothers, field mapping sponsorships and the Mine Kafon drone for other developers as well.